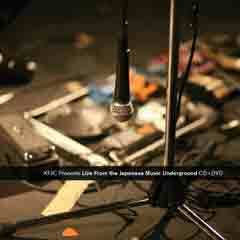 For many years the Japanese underground music scene has been active and innovative. Unfortunately, many of these music projects rarely travel outside of Japan. In August of this year, KFJC traveled to Tokyo, Japan to broadcast two nights of live music over our air waves, netcast, and video stream. We have documented some of the highlights on an amazing CD and DVD compilation. A must have! The KFJC 89.7 FM Live from the Japanese Music Underground Combo CD/DVD is available as our thanks for your generous donation of $45.00 or more.